As an Everyday Hero, you join a special group of monthly donors. You’re telling our patients that you’ll stand by them every day. Monthly giving is our easiest and most convenient way to give. By setting up your monthly gift today you can relax knowing your support is working every day whenever it is needed most. And if your situation changes for any reason, you can always change or cancel your gift online or with a simple phone call. 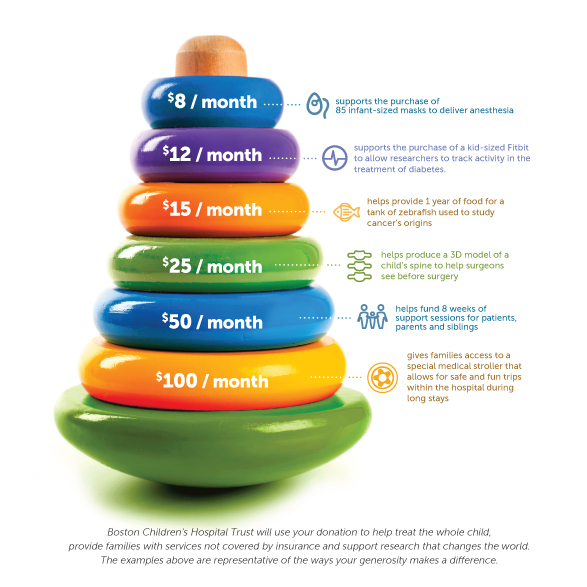 Every penny you donate goes directly to supporting Boston Children’s Hospital’s lifesaving work. Just imagine the impact you can make though your monthly gift. Questions? Contact us at everydayhero@chtrust.org or by phone at 617-919-6755.